Author(s): Loura Sanchez, Esq. & Melissa M. Garcia, Esq. Buy 3 or more titles in the Guide for Association Practitioners (GAP) series and save 20% off the member or nonmember price! The discount will display at checkout. Community association law is not simply a specialized area of real estate law. 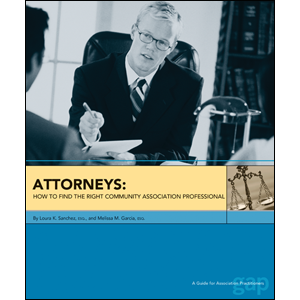 Attorneys representing community associations must be experts in many legal specialties including real estate, contracts, corporate law, premises liability, director’s liability, construction warranty, architectural and design review, insurance, environmental and water regulations, collection and foreclosure, employment and taxation issues. That’s why, next to selecting an association manager, selecting an attorney is the most important decision a community association board can make. It’s a significant decision with long-term implications, and volunteer boards should be well informed before they make it. • What should we do if the attorney doesn’t seem to be performing to expectations? • When is it appropriate to use more than one law firm? • How do we terminate one firm and hire another amicably? • How do we identify and find the kind of attorney we really need? • What questions should we ask in an interview and why? • How can we get the most from an attorney and still control legal fees? • Is it better to use an attorney or collection agency for serious delinquencies? This guide also includes six appendices with sample forms, checklists and documents.